Oh My Liberal Bleeding Heart! Regular page text goes here. For those who cajoled me, here’s an excerpt of The Light Who Binds . . . Enjoy! Lightning streaks across the twilight sky casting a brilliant glow on the building before me. Stone gargoyles loom above me, their eyes seeming to gleam and blink, their great amphibious wings, arched for flight. A slow roll of thunder fills the air as though the bowels of the earth are opening. I behold the formidable oak doors of the Dragomir Magical Artifact Shop, wondering what mysteries lie inside. Oh, I know many spells, charms, and magic secrets reside within the artifacts, but those aren’t the unknowns I seek tonight. Tonight, I anticipate learning secrets about myself. From behind me, the warmth of Jack’s chest radiates into my back, and Varg leans into my thigh. A measure of calm returns to me. Whatever news awaits me, at least I have friends at my side. I straighten my spine, lift my chin, and remove the remaining space between me and my future, pushing the heavy oak doors open to boldly stride in. As I enter the shop, eddies of dust coalesce from the swish of the doors into a whirlwind at my feet. I’m instantly comforted by the familiar shelves of aged magical texts stacked on bookshelves and delighted by the glass-doored cabinet stocked with magical artifacts. I was last here just a few months ago, but I feel like an entirely different woman now. Dragomira stands behind the counter and lifts her head with a weary expression, but a fierce glint fills her warm, brown eyes. She is not Dragomira right now. No, she is the Dragomir. Her movements, as fluid as rippling water, trace a path across the room as she quietly deadbolts the door behind us. With a wave of her hand, she beckons us into her back room. A small fire flickers in the fireplace, casting dancing shadows across the walls. Jack and I take a seat in wing-backed chairs next to the hearth, while Dragomira, still curiously silent, pours three drinks from a beautiful decanter sitting on an ornate wooden table amidst the chairs. She places one in my hand in silent command, watching as I taste it. The shock of whiskey burns my throat and slides warmly to my belly. She sets a glass in front of Jack and keeps the last for herself. The Dragomir’s eyes flare with a glint of yellow in acknowledgement. She’s right; after all, Jack and the Dragomir have kept me waiting on this information for months now. “Yes, why don’t you,” I answer curtly. The Dragomir raises her eyebrows and Jack gives me a warning glance, but I am not so easily cowed. I shudder at the thought of that pain, thankful I wasn’t there to feel it. Dragomira leans back, and her eyes glaze as her mind transports to another place and time. The firelight flickers, and shadows play artfully on the curve of her cheekbone. Then her husky whisper fills the room. “Lilith, I call on you to hear me. By my blood, you will be destroyed. a light that rips you asunder and destroys your darkness. By my blood, you will pay for what you have done. As these words wash over me, tendrils of fear sink into my flesh and thread through my soul. The curse grabs something deep and dark inside of me, and I start to shiver. I reach out for my drink and take another burning sip. She takes another drink of whiskey, a deep pull this time. I’m not sure if it’s the fire reflecting off them, but her eyes seem to swirl with yellow in their depths. I stand rapidly, knocking into the table and causing it to rock furiously, my glass of whiskey threatens to spill. The table eventually comes to a rest, but I do not. I fling myself across the room and pace as the thoughts roil around in my brain. Despite the cacophony of questions on the tip of my tongue, one thought rises urgently above the rest. They think I’m supposed to destroy Lilith! I spin around to see both Jack and Dragomira watching me with grave concern. Jack sits tensely on the edge of his seat as though ready to leap to my rescue. The light glints off his cropped golden curls, and he reminds me of a fierce golden angel ready for vengeance. Every hard plane of his body speaks of coiled strength and lethal abilities. I’ve felt those enticing planes beneath my fingertips just a few times, and I’m honest enough with myself to admit I want more. Jack and Varg growl simultaneously, and I guess the more she’s talking about isn’t quite the more I want. Dragomira deliberately refills my glass. I consider this a bad omen. She begins again, this time watching me intently. “Shaina was close with a woman named Mor who had the gift of sight. She warned Shaina that the villagers were coming for her. Still, they could not escape in time. When Shaina saw that she couldn’t outrun them, she entrusted Mor with Sorcha. Dragomira lifts her hand and a roll of parchment flies off the mantle and into her palm. She passes it to me, and I carefully unroll the aged hide. Quietly, I read aloud the ancient script that promises to reveal my fate. The DARK ONE spreads her plague across the land. Rivers run red and earth soaks black with blood. Man will fear the Cursed and greatly decline. When they hide like rabbits, the end is near. The DECEIVER will dance in her triumph. Beware! The PRETENDER has many ways. Foes renew and the Great Pact is broken. When Man wrongs Man, the BEAST has all but won. Yet one last path to deliver the Cursed. The scion of Shaina’s blood will shine BRIGHT. The LIGHT WHO SHINES will shatter the darkness. The LIGHT WHO SHINES will deliver the Cursed. The LIGHT WHO SHINES will assail the DARK ONE. The ANNIHILATOR will be destroyed. The ERODER OF SOULS will be rebirthed. Be steadfast, for the end is uncertain. The edges of the aged parchment nearly crumble under the force of my grip. I loosen my shaking hands, and color flows back into my knuckles. Varg, sensing my stress, leans heavily against my knee. He places his snout in my lap, raises his eyebrows and blinks his ice blue eyes. I wrap my fingers in his long fur, gaining strength from his comfort. I turn my attention to Dragomira and Jack. They clearly knew the prophecy, as their faces are not filled with questions; instead, a great solemnity surrounds them like a thick mist. Dragomira seems weary but resolute. Jack’s eyes burn with an unnatural shine, and fear and pain wisps around him in an eerie dance. Most telling of all are the tentative vines of hope intertwined with his concern. An unhappy agreement with my interpretation weighs their expressions. My hands tremble at the thought of that. It is not an event I wish to see in my lifetime. The image of Daylight Vampires taking blood at will and Dark Vampires going unchecked by Daylight Vampires horrifies my very soul. His jaw clenches, and his body becomes taut. Shame wraps around him as guilt leaks from him like wine through a sieve, filling all corners of the room. It feels as though the noose is tightening further. I can’t imagine that I’m special enough to be the savior of the breeds. Every scrap of my life has been a fight for even the smallest amount of respect, so to be cast in this light, as though I’m important . . . I just can’t grasp it. But, clearly, they believe it. Their heads snap toward me, four shocked eyes taking me in as though wings have suddenly sprouted from my back. I narrow my gaze as I take in their befuddlement. I was sure they would have known. Now, did you enjoy it or was it too much of a tease? Its no longer news that DR Zadson of EDUDUZADSONTEMPLE@YAHOO.COM is a man sent by God to help the lonely,oppressed,deserted and broken hearted. It was recently i saw comments of how this man helps restore lost love in a very short while and i have been depressed for long after i lost my husband to another. I made contact with him and i was told i will get results in 2 days but i actually didnt believe that as i have heard that from others whom i contacted and yet nothing but to my greatest suprise it all happened as promised and i could not hold this joy but resulted to this blog to talk about the goddness shown to me by Dr Zadson. If you are lost or confused worry no longer and contact Dr Zadson on eduduzadsontemple@yahoo.com he is god sent. The Light Who Binds, Book Two, is off to the Proofer! The Light Who Binds, Book Two is almost done! THE LIGHT WHO SHINES: New Book Trailer! The Light Who Binds: Spoiler Alert! 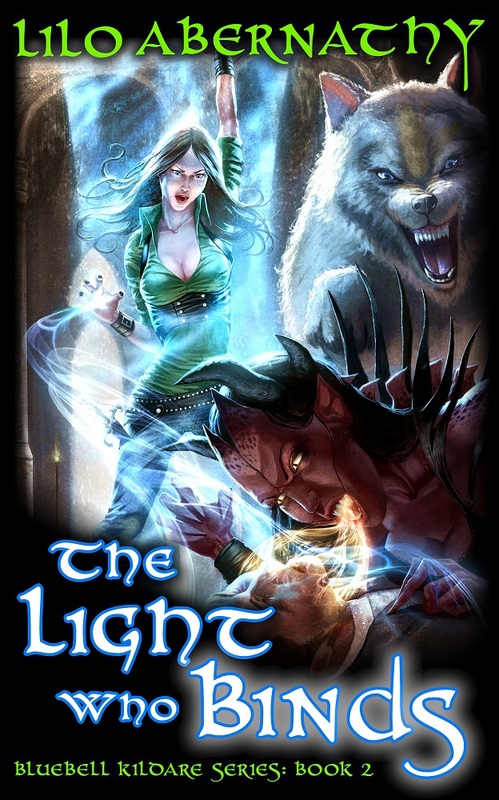 THE LIGHT WHO SHINES (Urban Fantasy) 4.8 Stars! News: Fun, Fun, and More Fun! Wall of Fame is First Established! My Blog is All Dressed Up in New Duds. Check it out!